For years we’ve been hearing that the U.S. dollar’s days as the world’s dominant currency are numbered. Remember when the yen was going to supplant it? Then came the euro. Next up: the yuan. Or maybe not. In the past few weeks, another rival to the dollar–created in 1969 but dormant for most of the time since–has made a spectacular re-entry onto the world scene. It goes by the ungainly name of special drawing right , and it is the currency not of some foreign rival but of the Washington-based and traditionally U.S.-dominated International Monetary Fund . It isn’t even really its own currency, since it derives its value from a “basket” that contains dollars, euros, yen and pounds. But it sure has become popular. In late March, the head of China’s central bank made headlines by arguing that the time had come for the SDR to supplant the dollar as the world’s “supersovereign reserve currency.” A few days later, a U.N. task force recommended the same thing. Then U.S. Treasury Secretary Tim Geithner endorsed giving SDRs a bigger role. After the dollar fell in currency markets in reaction, Geithner backpedaled. But at the G-20 meeting in London, President Barack Obama joined the assembled heads of state in agreeing to a nearly tenfold, $250 billion increase in the amount of SDRs available to be lent out. SDRs were created to supplement the Bretton Woods currency regime, which was built around a dollar linked to gold. After President Richard Nixon decoupled the dollar from gold in 1971 and allowed it to float freely in currency markets, the subsequent dollar crash led to talk of establishing the SDR as global reserve currency. That faded when the high interest rates set by Federal Reserve Chairman Paul Volcker to throttle inflation lured foreigners back to the dollar in the early 1980s. Since then, we’ve had an international monetary system in which the dollar is the main store of value. When countries want to protect themselves from the vagaries of global financial markets, they stockpile dollars the way nations in previous eras hoarded gold. This stockpiling has enabled the U.S. government to borrow almost without limit in global markets and until recently allowed American consumers to do the same. Over the short term, this can seem like a positive; we can get away with running a federal deficit that could hit $2 trillion this year only because of the dollar’s status as global reserve currency. But borrowing trillions isn’t really a ticket to long-run prosperity. In fact, the current economic crisis may have been spawned by huge imbalances in global trade and capital flows that are in part the product of the dollar’s special status. 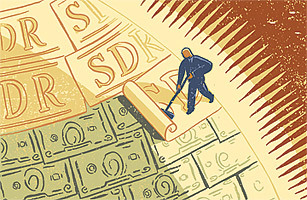 Global demand for dollars supplanted demand for U.S. products and services, argues Columbia University economist and longtime SDR fan Joseph Stiglitz, resulting in trade deficits, the decline of U.S. manufacturing–and years of supereasy mortgage credit. Is Gold Really the Safest Investment?